Francis II was the last Holy Roman Emperor, ruling from 1792 until 6 August 1806, when he dissolved the Holy Roman Empire of the German Nation after the decisive defeat at the hands of the First French Empire led by Napoleon at the Battle of Austerlitz. In 1804, he had founded the Austrian Empire and became Francis I, the first Emperor of Austria, ruling from 1804 to 1835, so later he was named the one and only Doppelkaiser in history. 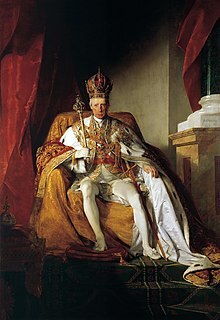 For the two years between 1804 and 1806, Francis used the title and style by the Grace of God elected Roman Emperor, ever Augustus, hereditary Emperor of Austria and he was called the Emperor of both the Holy Roman Empire and Austria. He was also Apostolic King of Hungary, Croatia and Bohemia as Francis I. 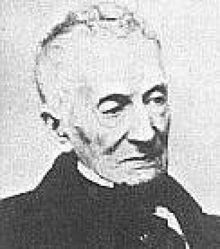 He also served as the first president of the German Confederation following its establishment in 1815. 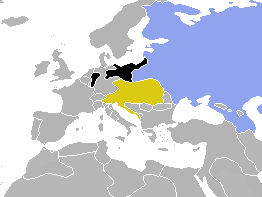 The Concert of Europe represented the European balance of power from 1815 to 1848 and from 1871 to 1914. 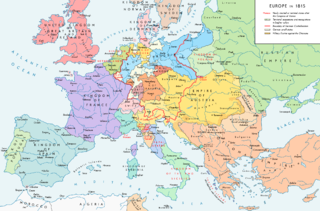 The Congress of Aix-la-Chapelle, held in the autumn of 1818, was a high-level diplomatic meeting of France and the four allied powers Britain, Austria, Prussia, and Russia which had defeated it in 1814. The purpose was to decide the withdrawal of the army of occupation from France and renegotiate the reparations it owed. It produced an amicable settlement, whereby France refinanced its reparations debt, and the Allies in a few weeks withdrew all of their troops. 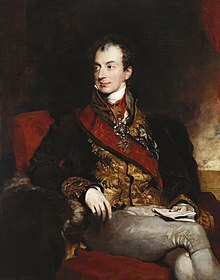 Prince Richard Klemens von Metternich, usually known as Richard (von) Metternich, was an Austrian diplomat and the eldest surviving son of the illustrious diplomat Prince Klemens von Metternich.